If you’re new to sushi, then firstly, where the heck have you been? You’ve been missing out on a huge number of delicious dishes, and all for what, a takeaway pizza? Well, now you’ve seen the light, we’d like to welcome you into the sushi circle by introducing you to a scrumptious type of sushi you might still be yet to try. This dish, fish fans, is called gunkan sushi. Gunkan sushi is a popular form of Japanese cuisine consisting of the basic ingredients – rice and nori seaweed accompanied by salmon, sea urchin or flying fish roe. The roe are the delicious and surprisingly colourful eggs of these tasty fish. The eggs of the flying fish (or tobiko) have an unexpectedly crunchy texture, a little bit like popping candy, and a mild smoky or salty taste. The larger salmon roe (or ikura) are more like the caviar you would buy from shops here in the UK. The word gunkan translates into English as ‘battleship’ and once you see these delicacies, you might appreciate the reference, because gunkan sushi is shaped a bit like a delicious little boat. To make gunkan sushi, the nori (seaweed which has been pressed and dried into a paper-like sheet) is wrapped around a base of rice to form an oval shaped cup. You then have a nice sturdy base on which to rest your fish roe (or “liquid” sushi). 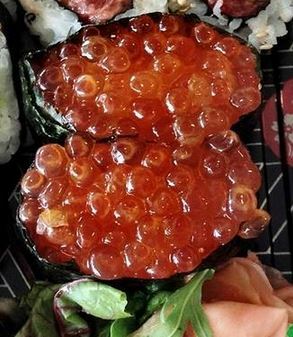 While fish roe is a common topping for gunkhan sushi, it can also be finished with oysters or quail eggs. How do you eat gunkan sushi? Thanks to the rise of sushi delivery restaurants in London and across the UK, you can now eat gunkan sushi from the comfort of your own home. Eating gunkan sushi is a simple matter thanks to the pragmatic design of the rice and seaweed vessel which holds the delicious fish eggs in place. Soy sauce is the perfect accompaniment to gunkan sushi; just remember to dip the rice into the sauce first or you risk losing your precious little eggs. Then eat with chopsticks, a little ginger and that all important wasabi. As always, just a little wasabi will do or you risk overpowering the subtle flavours of the roe. As with the majority of authentic Japanese dishes from sushi takeaways the world over, gunkan sushi is extremely nutritious. The raw roe is has a high vitamin and protein content which is further complemented by a favourable ratio of omega-3 to omega-6 fatty acids. The roe also contains a relatively high amount of cholesterol. However, as there is typically no more than a tablespoon size serving of roe on each piece of gunkan sushi, it can still form part of a healthy, balanced meal. This article was posted in Learn About Sushi, Sushi FAQs, Try Something New. Bookmark the permalink.